The bathroom is an important room in the house, but it can be hard to decide on a color for it. It’s a smaller room, so the color can either neutral or bold. It’s also somewhat separate from the house, so it can either be a part of the home’s overarching design them or can be separate from it. To help you out, here are four color trends for bathrooms. What is more iconic in a bathroom than a classic black and white checkered tile floor? Take inspiration from this and create a world of neutrals. Black grounds the color scheme while white creates a clean, refreshing look. Together the colors contrast each other enough to keep the senses guessing. Black and white colors can be included in everything from floor tiles to shower tiles to countertops. If you’re worried about too much black, then just use it as accent. Include fluffy black towels or a black shower curtain. Use small black, glass tiles as an accent in the shower and keep everything else white. 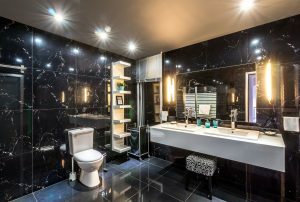 A bathroom is a small space, so you can have a bit of fun with it. Add a touch of glitter or sparkle to your bathroom to make it a stand out area. Use chrome fixtures that will reflect the light. Replace your vanity lights with something more eccentric. There are many light sconces that use metal or even crystal accents. Find towels with a bit of metallic thread or ribbon to pop even more. And finally, choose glass tiles that have specks of glitter in them. Bright red walls, deep navy walls, or jungle-green walls all fit in a bathroom. Really, color trends for bathrooms are all about personal taste. If you’ve always wanted a hot pink wall but don’t want to commit to it in the living room or bedroom, then try it in the bathroom. If you do go with a bold color, try to stick to just one; otherwise the space can feel overwhelming and chaotic. Pair with ample amounts of white to neutralize things a bit. If you want your bathroom to be a tranquil setting, then opt for calming pale color. Light blue, blush pink, and mossy green will help to create your own personal oasis. Find nice, fluffy towels to create a spa-like atmosphere. And if you have a bathtub, be sure to incorporate candles to really set the mood. A bathroom is more than just function. Make it your own space to get away from the hurry and stress of life. Pale colors will help soften the area and are one of the best color trends for bathrooms.